Choks company Agility offers web, mobile and cloud development as well as big data gathering, management, and analysis. Imagine the above is a caption to an Instagram photo of a table, a laptop, a cup of coffee by the pool. Wouldn’t it instantly change the scenario of how you imagine work is like? “Work” typically triggers mental images of men and women in office suit and briefcase. But increasingly the new breed of dot-com entrepreneurs and startup companies is changing the definition of work — from dress code to employee perks to a shift in office design thinking and hiring talents. While the Internet enables businesses to reach far wider audiences than before, it is also creating businesses access to new talent pool. Fuelled by worldwide broadband adoption and better collaboration tools, telecommuting is on the rise. When it comes to hiring talent, companies now have access to a talent pool of basically the entire Internet population. I have heard of instances where startups hire developers who work remotely from other continents or time zones. During my TV production trip to California last September, I met an entrepreneur who does just that - he hires and manages developers working from Southeast Asia. Last Friday, I had a chance to meet him, the CEO of Agility, Chok Leang, also known as Chok. 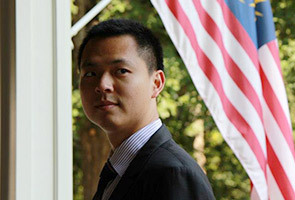 A Malaysian, he has spent more than a decade in the United States, with experiences encompass job roles in the financial district of Wall Street and thereafter startups in Silicon Valley before ventured out on his own. Headquartered in New York, Chok’s company Agility offers web, mobile and cloud development as well as big data gathering, management, and analysis. He leads a team of 140 UX (user experience) designers and developers across New York and Da Nang, Vietnam. Chok has advised and implemented strategies for over 50 startups in Silicon Valley, New York, Boston, Singapore, Beijing, Paris, and Zurich. Over dinner, he introduced me to the concept of "Startups without Borders”, and expressed that he wish that more startups would adopt this concept in the quest to hire the best talents and to gain competitive advantage. According to Chok, more entrepreneurs should explore establishing a borderless team. As he further explained about ‘borderless talent’, Chok said that it is not unusual to have people across 5 different time zones or more when he schedules for conference calls. “Our company culture goes beyond just working remotely, because we ‘cloudsource’ - leveraging all the available cloud computing resources, and taking advantage of distributed geography, instead of seeing it as a drawback.” Chok added. In an ideal world, a startup founding team would consist of highly experienced full stack engineer, a product visionary and someone with brilliant in business growth hacking. One of the biggest plus point to building a borderless team is the potential to reduce labour costs. If you can find an equally talented developer working remotely but at a fraction of the price of hiring an in house developer, you can allocate more funds towards building a better product. Building a borderless team does not lack its own challenges, but when all pieces come together, it gives one’s company with a vision to go international an added advantage. Are cryptocurrencies a blessing or a bane?